one bag, one case, much joy, keep it plain. 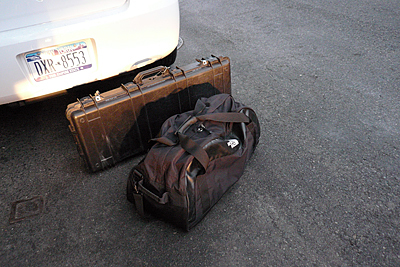 altho i have to admit, to me, seeing someone carry these from a building to a trunk, trunk to building, or any other errand like activity with these two things….. could only = trouble. but then again, i am bias. 1 shotgun. paperwork. 20g/28g/410g chambermates. 3 pairs glasses. assorted earplugs. allen wrenches. gloves. vest. gun sleeve. 2 towels. 1 shirt. 1 sweatshirt. grease. bore snake. shell bag. shell pouch. 2 bottles sunscreen. 2 hats. bug spray. band aids. walkie talkies. gps. ipod. chargers. cables. 2 bandanas. gum. moist towlettes. 1 rag. sharpies. petzel emergency headlamp kit. 300 shells.